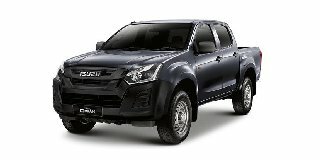 View the latest Isuzu D-Max vehicle prices below. The Isuzu D-MAX has new features which include Bi-LED headlights with LED daytime running lights, a colour-coded radiator grill, chrome front fog lamp bezels, convenient sliding rear windows, side-steps, chrome exterior side mirrors and 16” – 18” alloy wheels. You have the option of a manual or automatic 5- or 6-speed intuitive transmission with a refined turbo-charged diesel engine. The D-MAX has a spacious interior and is available in 2.5 litres and 3.0 litres diesel engine, 4×2 or 4×4 and offers up to 380 Nm and 130 kW of power. This bakkie is capable of towing up to 3500 kg.